We, the nutrition leaders and future nutrition leaders of Africa are committed to actively seek opportunities to advocate for evidence-based nutrition, and to promote a sustainable and healthy environment in order to improve the nutritional status of all Africans and to build unity and promote development in Africa. We are committed to promoting evidence-based and healthy food consumption practices and educating and informing individuals and communities regarding all issues involving nutrition. We are committed to the core values of integrity, respect and commitment in all our dealings and activities. Support and encourage effective resource mobilization and utilization. Networking and collaboration with nutrition role-players and stakeholders for national and international collaboration. Promote the use of appropriate technologies to enhance local food production and processing of nutritious foods. 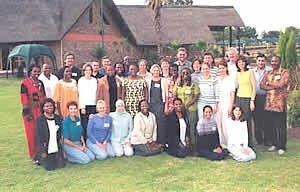 Ashraf Shaalan (Egypt), Stefanie Lemke (Germany), Anna Lartey (Ghana), Alice M Mwangi (Kenya), Prisca Tuitoek (Kenya), Phiny Hanson (Lesotho), Linono M. Sebotsa (Lesotho), Dorothy Chilima (Malawi), Nada Benajiba (Morocco), Ida Erasmus (Namibia), Hilda van ’t Riet (Netherlands), Aarinola Ojo (Nigeria), Lillian Salami (Nigeria), Jane Badham (South Africa), Penny Love (South Africa), André Oelofse (South Africa), Heidi du Preez (South Africa), Marjorie Moepi (South Africa), Chantell Witten (South Africa), Rozanne Kruger (South Africa), Aila Meyer (South Africa), Elifatio Towo (Tanzania), Wamuyu Maina (Uganda).